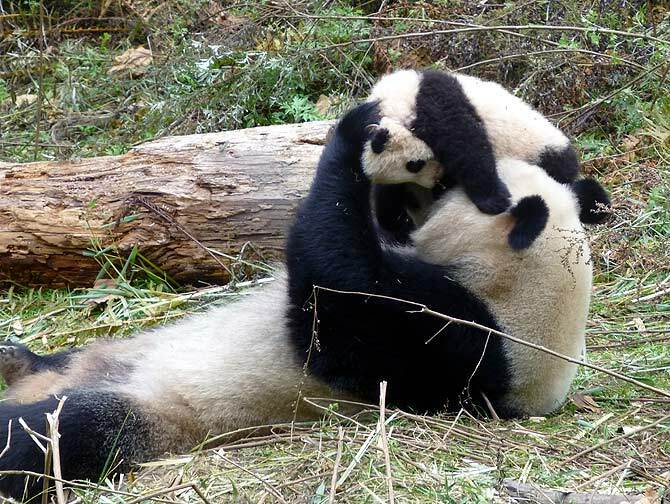 He hugs pandas in Wolong, China. 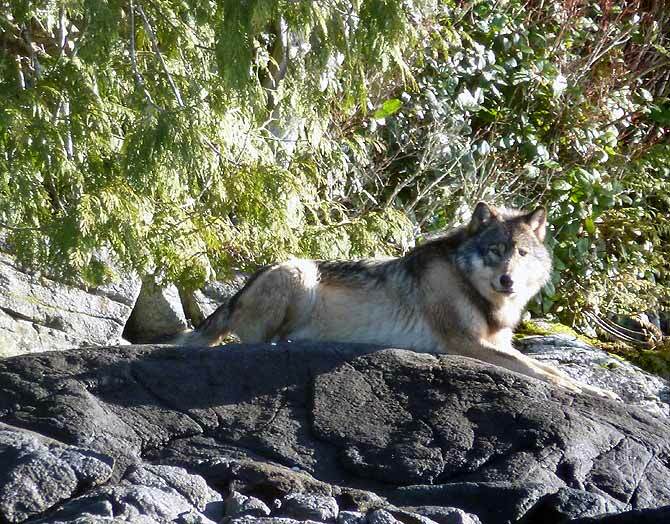 Follows no-longer-extinct wolves in Montana. Poses with sleeping elephants in Sri Lanka. Observes wild dogs denning in Africa and lemon sharks giving birth in the Bahamas. Paraglides with endangered vultures in Nepal. Sits, still as a mouse, as polar bears trample across the windscreen of his jeep in Alaska. For most of us, any holiday is exotic. How much more memorable a journey would be if it involves meeting rare wildlife in colourful lands and telling their story. That's what M Sanjayan does for a living. Sri Lanka-born, he is one of the more visible South Asian faces, internationally, in conservation. 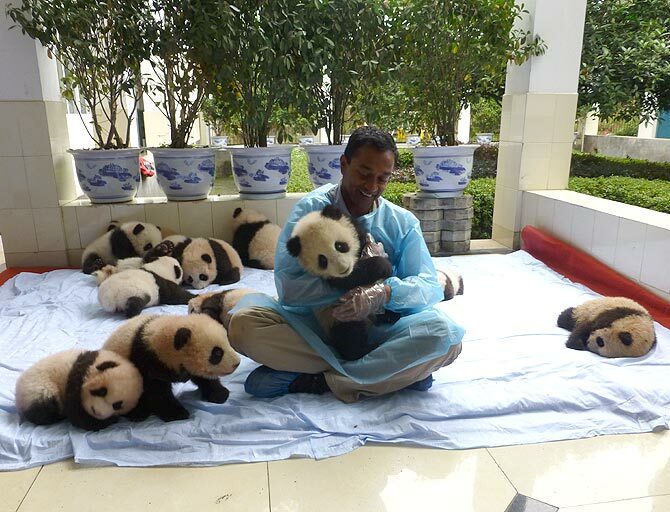 Ironically, it was his few minutes, on television, with actress Aishwarya Rai, rather than a Chinese panda, a couple of few years ago, that brought him more fame in the South Asian community he grew up in. His West African boyhood (Sierra Leone) -- parents worked in the UN and World Bank -- nurtured an enduring admiration for wildlife. A career in conservation, he has said, would not have come about had he been growing up as a desi in America, since there were so few role models. Nor would he have developed that special relationship with nature. "I think growing up in Sierra Leone was hugely influential to my life -- both because of the poverty around me, but also the amazing wildlife I saw. Probably would have been different if (I were) in the USA. Not too many role models." Lead scientist, for many years at Nature Conservancy, a prominent American charitable environmental organisation, Sanjayan has also hosted television programs dedicated to conservation, environment, biodiversity for The Discovery Channel, the BBC and now CBS. He recently joined Conservation International, a non-profit environmental organisation that has played a key role in protecting 260 million acres of environmentally important land, since its inception. He is their executive vice-president and senior scientist, and will have a stronger management function, but will still get a chance be able to go out and tell stories to audiences and travel. You are a passionate advocate for conservation being relevant to people. In our subcontinent, how can conservation make sense to poor people? I was once asked, 'How can you think about tigers and forests when in (India) people are hungry for the most basic needs'? The truth is, like most dichotomies, it's false. If you were to say, we will end poverty in India by getting rid of tigers or forests, then that's a trade worthy of consideration. But I am pretty sure in reality all that will happen is India will lose its tigers and people will still remain in poverty -- in fact they will be poorer forever for having lost something so unique and valuable to generations to come. Look, conservation is not a luxury to think about after you consider health, sustenance, security, etc -- it is the basis for all life. The water you drink, the food you eat, the medicines that cure you, they come from nature. When nature thrives, human communities thrive too. When nature is poisoned, we feel its effects. We are, after all, part of nature. We are not separate from it and the poor, especially the rural poor, who can't afford bottle water when the river runs dry, or who can't afford to build a sea wall when sea levels rise, or who can't afford to eat chicken when the fish are all caught -- they are the ones who will suffer most. So saving nature in the end is about saving people. The organisation I work for, Conservation International, gets that and it's what makes my job so very interesting. Our subcontinent -- not unlike other places in the world -- has had traditional and very innovative ways of looking after the environment to prevent exhaustion of natural resources. That is slowly changing. New urban generations have a very poor grasp of protecting the environment. What have you had a chance to observe? And what is your take? We are from a unique place -- a subcontinent with 1.5 billion plus people and still elephants, tigers, bears, storks, eagles, snakes, sharks. I truly believe this has to do with our cultural reverence for nature and a deep understanding of how nature sustains communities. In our Ramayana when Rama sets out to build the land bridge to Lanka, the squirrels come to deposit sand from their fur, into the water to help him. I have a collection (Poems of Love and War, translated by the late poet-playwright-scholar A K Ramanujan) of 2,000 to 3,000-year-old Tamil poems. They are lovely and every one of them has a reference to nature. It is obvious to me that our ancestors understood the importance of nature to a crowded and heavily agricultural sub-continent and we forget those lessons at our peril. 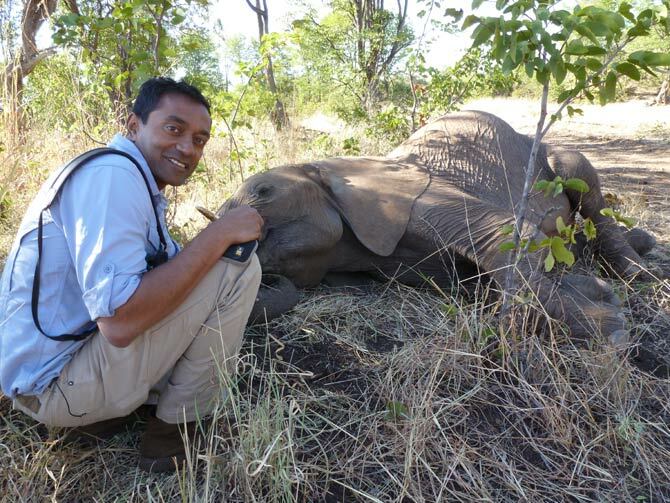 Image: M Sanjayan poses with a sleeping elephant during a hike in Africa. Not too many people from India or Sri Lanka work in conservation, be it back home or in America. What is your message to youngsters on why conservation is the field they must consider? For a long time, even some in my family were doubtful about my prospects. Saving nature, tramping about looking for wildlife, well that was fine as a hobby, but not a career to be pursued. We were supposed to leave that sort of thing to Western experts -- that prejudice runs deep in some of our communities, but it is changing. From a pragmatic point of view our field is rapidly growing. But today it's not just about saving nature, it's also about understanding and creating value for nature and nature's services and for incorporating those values into business supply chains, pollution controls, government policies, aid work, and education. You no longer have to be a biologist to work on saving nature -- today the field is dominated by people with backgrounds in social media, communications, economics, social sciences, and business. Second, what we do about our planet in the next 10 or 20 years is going to be crucial to our existence. There is nothing more important to our long term future. NOTHING! How can you sit this out -- what a great time to be born and what a great time to be engaged. If Microsoft can appoint someone of Asian heritage to be their new CEO, why can't the environmental movement have more Asian leaders? 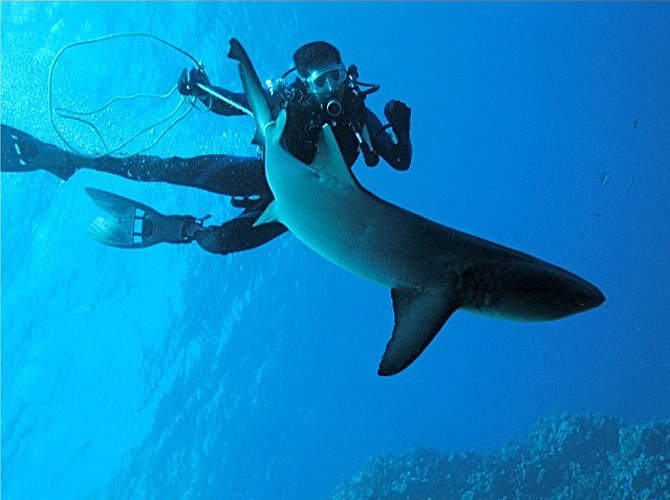 Image: Trailing a shark in the Coral Sea, Australia. In a world where we are trying to be kinder to our environment and reducing our carbon footprint, what strikes you as the most interesting trend in conservation? And one that will have important impact? Two things. First, a lot of young people are getting involved -- empowered by the Web and impatient for change they are demanding action about the planet they will inherit. Second, business, especially big businesses like Coca-Cola, Walmart, Starbucks, Dow Chemicals, and others are very much in the game now. See, they understand that sustainability equals availability of natural resources so if you want to build like 'there IS a tomorrow,' to use Sir Richard Branson's words, you have to think long term about natural resources like water. Business also hates uncertainty and they know that climate change will increase uncertainty dramatically and that's why they are far ahead of governments in terms of pushing for adaptation and in some cases proactive regulation. 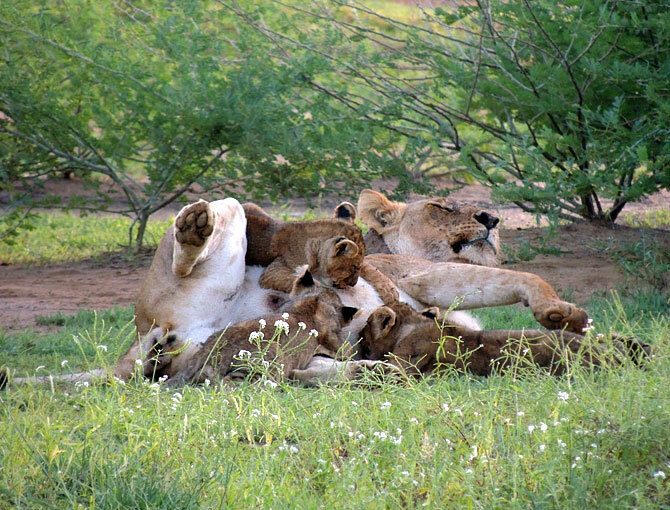 Image: Lions in northern Kenya. You have presented many programmes on the story of wolves in Montana. What is the most important to take away from the return of the wolf story? Are there obvious areas where it can be replicated? Especially in our subcontinent? It's not simple to live with a predator, with something that on occasion can harm you. But there are two lessons to be learned from the return of wolves to Montana. First, we can mitigate the damage with practices that reduce conflict. And second, people, local people living closest to nature must have a say in how their lives are to unfold. It requires trust and empathy and it won't always work. But unless you have local community buy in and local people accrue some of the benefits the wolf (or in the case of our region -- elephants or tigers or leopards) will remain someone else's problem. 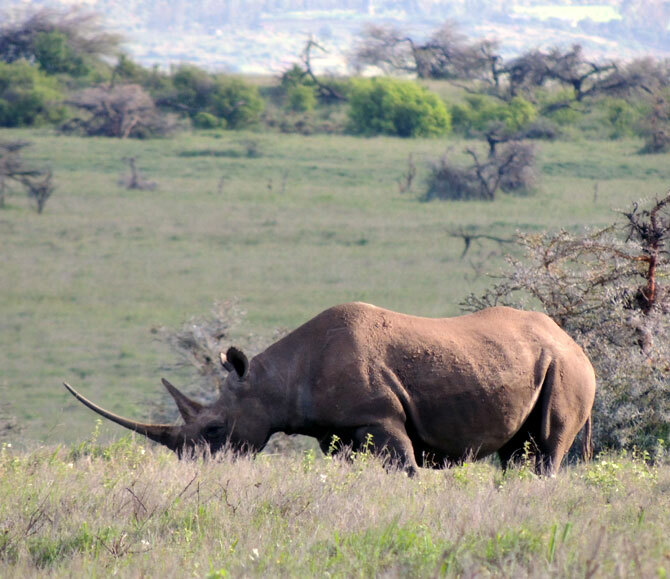 Image: A rhino at the Lewa Wildlife Conservancy in Kenya. You have spoken in an interview at some length about how conservation tends to attract more white Americans, rather than Americans belonging to ethnic groups from Asia or Africa. That might change with second and third generation Indians, Sri Lankans, given that earlier generations first struggled to make a life in America? Maybe, I hope so, but I am still not seeing enough progress in this matter. Our families want to succeed and they push their kids to succeed and that is often measured in how much you make, what car you drive, or how big your house is. It should also be measured in how much you contribute. Yes, historically many of our families viewed environmentalism and nature as something nice to do, but not critical. As my grandmother put it when I returned with my doctorate to Sri Lanka 'My grandson is back, he is a doctor now, but not the kind that helps people'. It was funny at the time, but I think its now time to prove her wrong. What we do, when we work on saving nature, is indeed contribute to saving non-human AND human lives. 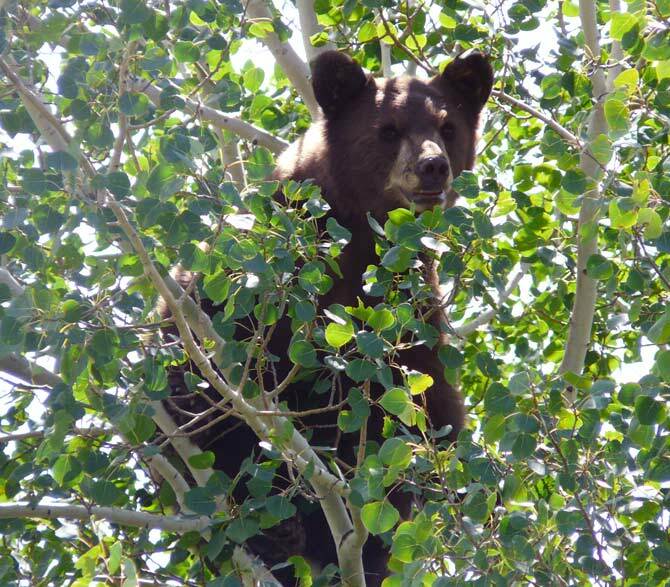 Image: A black bear near M Sanjayan's home in Montana, USA. Are fellow Sri Lankans surprised at your profession? What do you say when people ask? I understand your parents realised what you did was important only when you had a chance to interact with Aishwarya Rai on television. On that same trip to India I met with both Aishwarya Rai and (separately) President (A P J) Abdul Kalam. I have to say, for many, the Aishwarya Rai meeting was more impressive -- and she, of course, was thoughtful and generous with her time. I suppose we live in a media culture where being a celebrity or being on television gives you credibility. I can understand that and what I want to do is make sure that the brief moment I have in front of the camera is put to use supporting the cause of conservation. Do you feel that the media in America, and/or the world over portrays animal issues and environment issue the way they need to be? If not, what is lacking? I am the first one to admit that there's no point doing a story if no one is going to watch. So you can't just blame the media, the audience, all of us, also have to take on some responsibility. We who work in media need to be far better story tellers. My dad, A Muttulingam, is a phenomenal story teller and he has published dozens of books and essays in Tamil. I learned the art of telling stories from him -- about timing, characters, and narrative drive. We need to bring some of that great storytelling into environmental coverage. What I would like to see is the media taking the time to cover stories in more depth, and not be afraid of taking the risk to wade into the complexity of an issue. We need to focus on issues as they matter to people's lives using strong characters in the narrative and be creative storytellers to get our message across about the environment. Image: A wolf looking for herring during spring herring fish runs in the Great Bear rainforest, British Columbia, Canada. What did your background and upbringing teach you about preserving the environment? I was lucky to grow up in Sri Lanka where Asiatic wildlife can still be found in reasonable numbers. Then my family moved to Sierra Leone I was surrounded by nature. I didn't have a lot of friends as a kid, because my family moved so much, but I was always comfortable with animals and I had all sorts of pets, dogs of course, but also things like parrots, snakes, and a tortoise. I also very early on got to see first hand what farming, forestry, and fishing looked like for rural people. That first hand experience, going to a school where I knew I was privileged, or seeing kids come to fetch water from a stream near our home gave me a real appreciation for the connection between people and nature. Of course, my parents were always encouraging -- and filled my room with books about things I was interested in. They didn't quite get it, but I don't remember them ever discouraging me -- they knew my curiosity was deep and they always did their best to fill it. Image: A panda mom and cub at the Wolong panda centre in China. What are some of the truly most magnificent animal sights you have had the privilege of seeing? I have been in a vehicle within the Arctic Circle with a dozen polar bears surrounding the vehicle, some testing the windshield to see if it might break, like ice. In Kenya, just last year I walked by accident right into the denning grounds of a pack of African wild dogs. In Sri Lanka, some colleagues and I hiking through the forest walked right past a sleeping elephant; it woke up and scattered our group with a charge. In the Bahamas I have held a female lemon shark while she gave birth, literally in my hands to a small slippery live baby, and shared the sky paragliding with endangered vultures in Nepal. In Sichuan province in China, just a few months ago, I had the privilege of spending a day in the mountain forests with a young Giant Panda. It has been an extraordinary privilege that I don't take lightly. 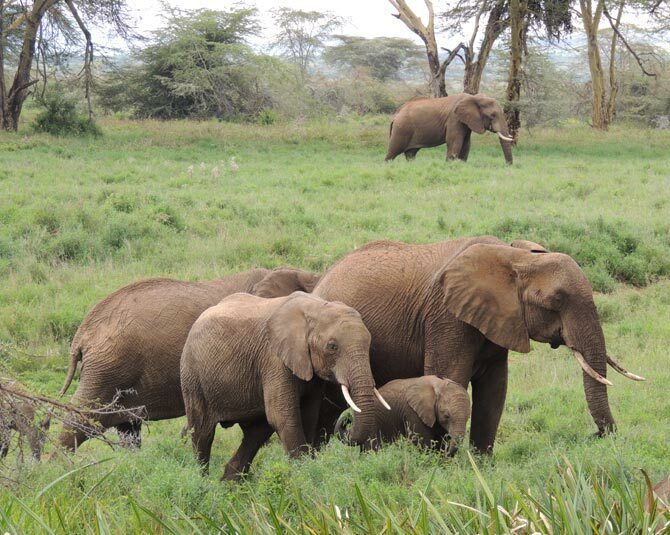 Image: Elephants in northern Kenya.